Contractors: Granite Construction and Water Systems Consulting, Inc. The Carmel River Reroute and San Clemente Dam Project is the largest dam removal project ever to occur in California. The dam is a 106-foot-high concrete arch dam located on the Carmel River in Monterey County. When constructed in 1921, it had a reservoir storage capacity of approximately 1,425 acre-feet. Today the reservoir has been filled by more than 2.5 million cubic yards of sediment, leaving a reservoir storage capacity of approximately 70 acre-feet. The California Department of Water Resources Division issued a safety order for the dam structure in the early 1990s, saying the structure could potentially fail in the event of large earthquake or flood. 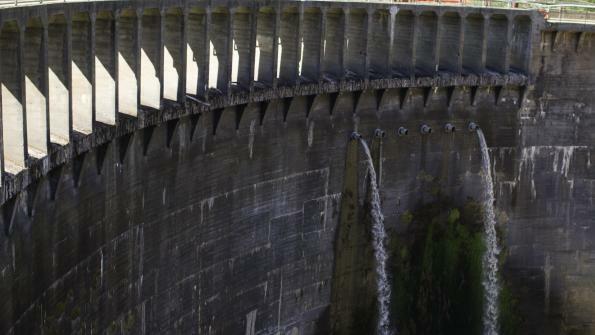 Strengthening the dam would resolve the public safety issues, but would not address other environmental issues, including the salvaging of beaches and animal habitats. The better option proved to be removing the dam, which would improve safety and provide benefits to both steelhead trout and California red-legged frogs. The plan calls for deconstructing the dam, leaving the sediment in place, and rerouting the river around the sediment. This will allow the river to return to a natural state not seen in nearly a century. California American Water, the dam owners, will donate the 928-acre property to the Bureau of Land Management. The project area adjoins two regional parks, creating over 5,400 acres of combined open space available for hiking and passive recreation. Estimated project construction cost is $83 million, with $49 million funded by California American Water and $34 million from the State Coastal Conservancy, which will raise its portion of the funding from various state, federal and private sources. The project should be completed in the late fall of 2015.
improving habitat for threatened California red-legged frogs.